2. Sift the whole wheat flour, baking powder, baking soda, and salt into a large bowl. Stir in the brown sugar and lemon zest. 3. Beat the bananas, eggs, buttermilk, vanilla and melted butter. 4. Fold the banana mixture into the flour ingredients, with just 10-12 quick strokes of a spatula. 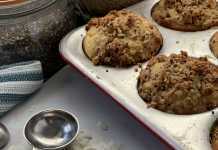 The batter will be lumpy and streaked with dry flour, but it is essential not to over-mix the batter for a tender muffin. 5. Carefully fold in ¾ of the blueberries with another 4-5 strokes. By this time the batter will mixed in but still a little uneven. If it is too smooth, you’ve over-mixed it! 6. 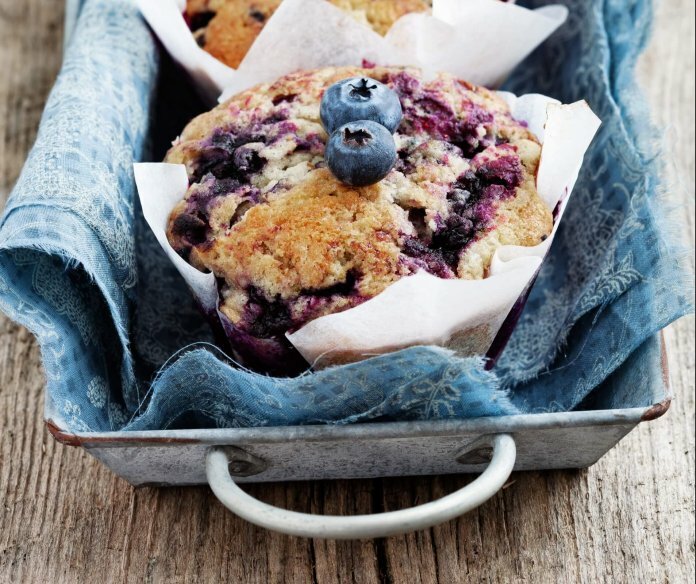 Fill the muffin cups ½-⅔ full, depending on preferred size, scatter the remaining blueberries on top and sprinkle with the remaining tablespoon of brown sugar. 7. Bake for 25 minutes or until a toothpick comes out clean. These muffins freeze really well, so IF you have any left over, bag and freeze’em! 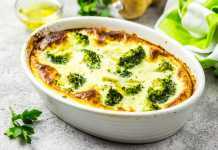 If you don’t have buttermilk on hand, you can make a substitute by adding 1 tablespoon of lemon juice or 1 teaspoon of cream of Tartar to 1 cup of regular milk. If you cannot find whole wheat pastry flour then substitute half whole wheat flour and half all-purpose flour. Just swapping in whole wheat flour will result in a drier and grittier muffin. Eat all sweet things in moderation. A little bit of what you like does you good, but don’t overdo it.